This family owned and operated motel welcomes you to Lancaster County, Pennsylvania. 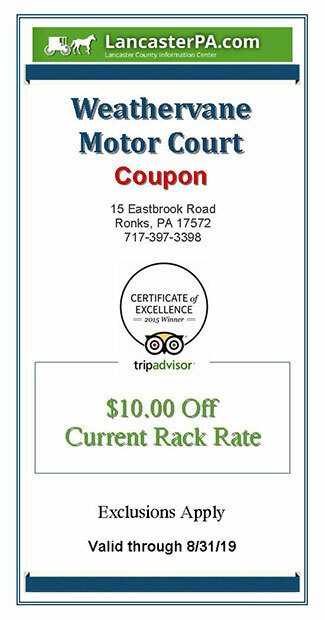 This coupon will entitle you to save $10.00 off the rack rate during your stay at Weathervane. The Weathervane Motor Court has been recently renovated and they invite you to relax in their comfortable motel while you enjoy all that awaits you in your visit to Lancaster. Weathervane is in a great location on Route 896 just off Route 30 east of Lancaster. It is very close to outlets, entertainment, restaurants, and many of the local Amish attractions. There are Amish farmlands right behind them. See the map below to see how close they are to local attractions.